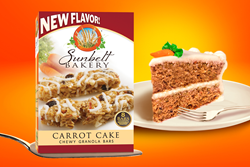 Sunbelt Bakery adds Carrot Cake flavor to its line of chewy granola bars. This new flavor uses real carrots and a tasty cinnamon spice blend to capture the essence of the iconic taste of carrot cake -- all in a quality granola bar that is made with whole grains and has no high fructose corn syrup or preservatives. Featuring real carrots and a tasty cinnamon spice blend, Sunbelt Bakery’s newest bakery-fresh taste is an instant classic. What happens when you combine a family favorite with the granola bar that’s known for having delicious, bakery-fresh taste? There’s a good chance you get a hit. In addition to its soft, chewy texture and instantly recognizable blend of cinnamon, nutmeg and other spices, the new Carrot Cake flavor also includes real carrots. Like all of Sunbelt Bakery’s granola bars, the new product is made with whole grains, no high fructose corn syrup and no preservatives. New Carrot Cake Chewy Granola Bars are a permanent, year-round flavor that are now available at retailers nationwide. The new flavor comes in a Family Pack box of eight bars, each having 130 calories per serving and a suggested retail price (SRP) of $2.69. To learn more about Sunbelt Bakery and its wide variety of snacks with that bakery-fresh taste, visit http://www.SunbeltBakery.com or follow Sunbelt Bakery at http://www.facebook.com/SunbeltBakery or https://instagram.com/SunbeltBakery.